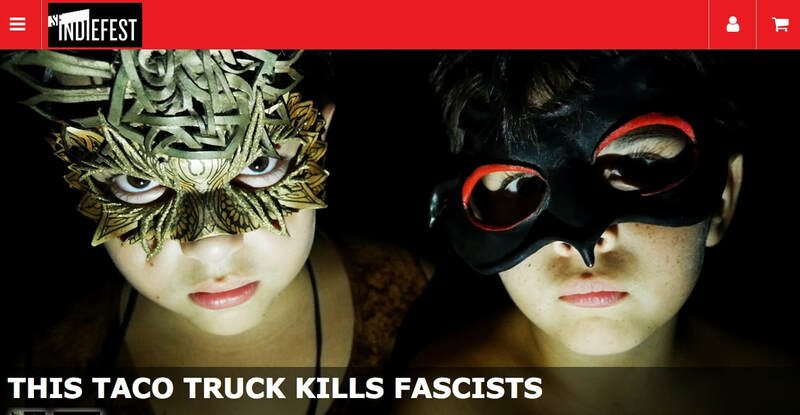 THIS TACO TRUCK KILLS FASCISTS is the second feature in Rodrigo Dorfman’s "Occupy the Imagination" trilogy, exploring cultural resistance in the Americas. It is also about how revolutionary consciousness is transmitted across generations and the challenge this poses when parenting Latin American children in an age of rampant anti-immigrant hysteria. New Orleans-based performance activist Jose Torres-Tama has a dream: to create a revolutionary Taco Truck Theater with a simple message: “No guacamole for immigrant haters”. Inspired by Woody Guthrie’s motto: this machine kills fascists, This Taco Truck Kills Fascists is an epic journey born out of the urgency of the now and our responsibility to engage and confront white supremacy with the weaponized beauty of Art. The film features José Torres-Tama and the Super Beings of the New Orleans-based ensemble of the Taco Truck Theater/Teatro Sin Fronteras: Spirit McIntyre (Cellist, Vocalist, Lyricist, Sound Healer, Lover and Egun Magnet); Natalie Jones (Actress and Singer); Roberto Carrillo (songwriter, multi instrumentalist); Michael Ward-Bergeman (songwriter, multi instrumentalist), and Tacos by Heidi Hickman. The film also features the youngest members of the Taco Truck Avengers: Diego (7) and Darius Torres-Copeland (10). This is a moving film that documents the life of a performance artist father trying to raise his boys with the consciousness needed to understand an empire that has migrated deep into the dark side, and has made Latin American immigrants the enemy, while pimping hate and fear and advocating a white nationalist agenda of violence towards all people of color. The diverse and bilingual ArteFuturo Ensemble perform a visually dynamic show with moving stories that offer a parallel between Latin American immigrants dehumanized as "illegal aliens", and the historical struggle of African Americans with a national crisis of police shootings of unarmed black civilians. They proclaim that, "No human being is illegal!" & that "BLACK LIVES MATTER!